In the first of our conversations, recorded for use in a future book, Miller talked about his competitive drive, how his father’s work ignited his curiosity and imagination, and the founding of Apogee. If one were to sculpt the Mt. Rushmore of PC gaming, Scott Miller’s handsome mug would deserve a prominent position besides the likenesses of other visionaries like Sid Meier and Will Wright. Miller almost single-handedly laid the foundations for the video-game industry’s arrival in Texas with the founding of Apogee Software, Ltd., which helped studios such as id Software get their start. Arguably even more famously, he pioneered the concept of shareware–splitting full games into episodic chunks and giving away the first chunk for free. In the first of our conversations, recorded for use in a future book, Miller talked to me about his competitive drive, how his father’s work ignited his curiosity and imagination, and the founding of Apogee. What did you like to do for fun as a kid? You know, before computers and video games came along and rotted your brain? I’m the firstborn and I have a brother who is younger and a sister who is 10 years younger. I pretty much did things on my own with those kinds of age gaps. I was always pretty active. In my teens I got into martial arts. I love sports like baseball, big-time into swimming and bike riding. Definitely into a lot of outdoors stuff. My dad inspired my adventurous nature. When I get into something, I try to become an expert at it. When I got into mountain biking, I very quickly got really good by just pushing myself. I also had a lot of friends who were very competitive by nature. Everything we got into, we tried to push into the top 10 or 20 percent of the sport as far as the amateur level goes. When I get into stuff, I just dive into it head first and strive to become really good at it. I think it’s just a natural desire to do the best at whatever you’re doing. If you’re doing something, why not be the best you can be? We would push ourselves to the highest limits. Like snow skiing for instance: I started out when I was 32 and that first year we ended up going five times. I got good pretty quickly. The better you get at something, the more you can enjoy all it offers. It’s just more fun at the higher skill levels, I guess. Did your friends enjoy those activities? I guess the friends I hung around with–I don’t want to say “the friends I picked” because it never works out that way–but the friends I’ve been attracted to, we all had the same competitive nature. Like now, we’ve got these social games you can play on your phones. There were always competitive elements; they’re not always friendly games. We were always trying to push ourselves to be the best we could be, to master all the little tricks to things. It’s just my nature and the nature of the friends I’ve been with. Having friends like that around me forced me and them to really push ourselves. We used to do a lot of smack talk. We don’t do too much of that anymore, but the goal’s always the same: to crush each other, and sometimes exchange some of that talk. So many children inherit traits and interests from their parents. What did your parents do while you were a child? My mother was pretty much a full-time mother. She had a couple other jobs while I was growing up, but nothing really career-wise. Just for fun. Actually, she worked for Apogee for probably a good two years. She was a very early employee back in the early ’90s. Back in the days when we were a direct order business and had people calling in, she was involved with fulfilling orders. I would definitely say [we were close]. I definitely took an interest in [my father’s] work when he worked at NASA during the Apollo program. I was definitely into space things as practically all kids are. We’d never miss an episode of the original Star Trek when it was first being aired. It was always an exciting time when there were the two Apollo missions. So I was pretty aware of it back in those days when I was 8, 9, maybe 10. His job was very interesting to me because it was all about the space program. I don’t know if that kicked off my interest in science or played into it, but as a kid I found it very interesting, that whole side of things. Space is interesting. My first idea for a career was, I was going to be a scientist. In fact, very early on I thought I was going to be a scientist. That was a very fascinating subject to me. Even at 13, 14 years old, I was reading all sorts of science, physics, and astronomy books. I don’t know if that was because of exposure to my dad’s work or just a natural thing, but I was always interested in science. He was always building electronics. He was building digital clocks well before I can remember them being sold in stores. We had all sorts of new electronics around the house growing up that were not sold in stores. He was always making things out in his workshop. I don’t know if that was a source of pride; I didn’t think of it that way back then. I just found it interesting that my dad could build these amazing things. In fact, he was probably using components that would have made them way too expensive for retail sale at that time and built them simply for the design challenge. These are things he would tell us weren’t available in stores, but he was never trying to show off. I think he made things purely for the fun of it: to design things that were ahead of their time. I was fascinated that he could just build stuff like that. There were times when I would go out there and try to think of some cool electronic device that I could make. I was always a big James Bond fan, so maybe something that was a cool secret spy-something-or-other. But they didn’t work, frankly. I could never figure it out because it was all way too advanced for me at the time, so I never did anything like that. I kind of tinkered around and soldered things here and there, but nothing more simple little switches. That was all I ever built. 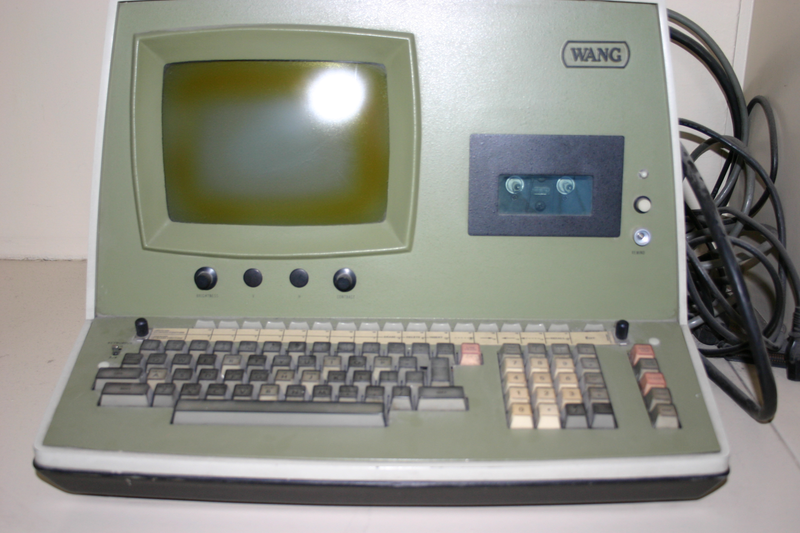 A Wang 2000, the computer on which Miller learned how to program. You’re known as one of the frontiersmen responsible for planting the seeds of the video-game industry in Texas. Have you always lived in Texas? Back in 1972, the Apollo program came to an end. My father got a job with E Systems, which was later bought by Raycon, which of course is the big military contractor. In central Australia, right in the middle close to a town called Alice Springs, there was a place that had the big space base. It’s kind of like the Area 51 of Australia: it’s supposed to be really top-secret, really well guarded. They did a lot of secret stuff there, but primarily what I think it is, is a satellite tracking station for that part of the world. We were there for five years. We moved back here for me to graduate from high school, and they [parents] actually went back for two more years while I stayed and started going to college. I vaguely remember not being too happy about [moving to Australia]. I grew up in Florida and had a lot of friends, but when I moved to Australia I quickly made new friends, so it wasn’t that big of a deal. As far as I can remember, I grew up in Florida, then we moved to Australia and stayed there for five years, basically my high school years. We moved to Texas and I’ve been here ever since. So really the hardest part was, for me, leaving Australia, where I had really solidified some strong friendships as a teenager going to high school. Coming back to Dallas to live meant starting fresh at 17, 18 years old. By that time people have already developed cliques and groups and so on. It’s kind of hard to break into those friendship circles. I remember six months to a year of not having the social circles that I wish I would have had, the ones I had back in Australia. I remember going to high school and spending a lot of time in the computer lab. I actually became friends with the computer teacher. We had an Apple II computer at the high school and I would spend a couple hours after school in there. That’s where I met George Broussard, who later became my business partner. He became my first good friend here in Dallas. When did you discover computers? It’s funny: through high school, the only time I got a grade less than a ‘C’ was my computer science class. I got a ‘D’ in it. I think the issue there was, someone donated a computer to the school. It was a Wang 2200, and very PC-like. It had a built-in floppy drive, built-in keyboard, built-in screen. It was really ahead of its time, looking back, but the teacher didn’t know anything about it. It was his first computer. I remember that as we went through the course, the teacher couldn’t always explain things very well because he wasn’t very ahead of the class as far as learning it. Because he didn’t explain things that well, it didn’t seem very exciting. I remember most people in the class received a ‘D’ just because the class wasn’t put together well and wasn’t very interesting. Computers seemed very boring to me, like large calculators. But then, a month or two after that course, a friend said, “Hey, you want to go play some games?” I said, “What do you mean?” He said, “You know, on the computer.” He’d gone and found some magazines–one at the time was called Freedom Computing–and every issue had a game written in BASIC that you could type in. I didn’t have enough time to learn during school so I’d leave a lab window unlatched. After hours I’d go back over, just crawl through the window and stay for around three hours at a time, just me and the glow of the computer screen as I typed in my games. The principal said, “Tell you what: we’re going to give you the key. You don’t need to break in anymore. But only under the condition that if the teacher needs any questions answered, you help him out.” It was a done deal. There I was, 15 years old, and I had the key to the school so I could go in and use the computer. I did that for the last six months that we lived in Australia before we moved back to the States. As soon as we got back, my first priority was to get my father to give me the money to buy a Commodore. I’ve had a computer ever since. What intrigued you about programming? There was some sort of very powerful, creative thing that you tap into. It’s really like, you’re building something from your mind. Even back then it was like I was creating these worlds purely from my imagination. I’d play those old text adventure games like Zork, and it’s funny: even though they were just text, you’d have these very vivid pictures in your mind of what those worlds looked like. So even just making games based on text, it was still tapping into something very powerful. It was world building. It’s almost like you’re playing God: you can make the worlds you want to make with the rules you want to make. I think it’s absolutely crucial that if you have any desire to be a coder, you have to have it within you to want to express your own creativity and come up with your own ideas, and make them become real on the computer. Anyone who is going to college to learn how to program and doesn’t go home and spend 10 to 20 hours a week on their own coding what they want to do–those people aren’t going to go far. You have to love it, and you have to want to be doing it outside of school projects. You have to be thirsty for knowledge A painter has to paint, a writer has to write, and I think a coder has to code. You have to have so much experience because coding is all about solving problems, and solving them in very elegant and efficient ways. What about video games? Did your interest in computers kind of sync up with your interest in games? When I was in Australia, as far back as 1975 or ’76, I’d heard there were a couple of arcade games, but they were very simple and not really compelling. It all kicked off, I think, with Space Invaders, which I think came out in ’79. That was the game that really shook the whole arcade industry worldwide. That was the game that was the ground zero for everything. I was totally into that game and tried to master it. Very quickly after that game came out, a ton of other games followed. Atari games, Asteroids, Missile Command, Defender. The industry exploded for a couple of years. I loved playing games at the time. I was writing a weekly column for the Dallas Morning News–which didn’t pay much of anything at the time, maybe six dollars a column–and I ended up having to work other jobs. One of those other jobs was at an arcade. My partner George and I worked at arcades during that time. That’s another good example of adding to our background for what we later started doing, which was making games. We worked at arcades and played games. After arcades would close, we could play all the games we wanted for free. We played and played and played, mastered many games and learned what made them fun. Looking back, I see all that as more of an educational foundation than going to college. I hadn’t really thought of it until now, but I guess I applied my drive to video games, too. I really maxed it out, tried to understand strategies and be an expert at games. 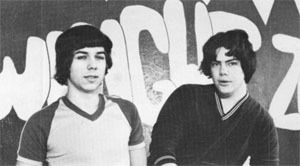 George and I ended up writing a book back in 1981 about how to beat arcade games, won a few local tournaments. So it’s almost like no matter what the interest or profession, if you’re going to get into something, you might as well do it all the way. How did you get involved in the games business, in as much as the “games business” existed then? When I was going to college, I was actually changing degrees. I enrolled and started taking computer science courses. I figured, “Okay, I love computers.” I was learning languages like Fortran and Cobol, but these were not the languages that I cared about because those were languages used in business and science environments. I wanted to do something more fun. The computers I had at home–I had one or two at home–used the BASIC language, and other languages like C and Pascal. Definitely C became the language of the games industry; it’s a very powerful, simple language. So at the time there was no college degree that had to do with gaming as a career choice. It was all very business oriented, and it just wasn’t very interesting, honestly. It also wasn’t very challenging. The assignments were very simple. I got good grades; any subject within computer science was very easy. The whole time I was in college, I was also trying to start businesses and make a career path that was more interesting. I didn’t want to get a computer science degree and end up working as a systems analyst somewhere. I didn’t see a future in that. I was really focused on learning how to make games on my own and find some way of selling them. After I wrote that book on beating arcade games, that allowed me to parlay that into starting a weekly computer games column in the Dallas Morning News, and I did that for four years. Then I thought, “You know, I like writing.” I thought that was going to be my avenue into the industry. I was always making little games on the side, but I wasn’t sure I could make a career out of it. I thought I could probably make a career of writing about the industry. It turns out that writing that column was another really good bastion of education as far as leading up to what I’m doing now. When you write about things and you’re critical of things, analyzing things, you can see what people did right, what people did wrong. It’s very educational. That background, when I finally did realize I could become a game designer as a career move, that background of writing about the industry–I also wrote freelance for several magazines at the time; that background really helped out, looking back. “Kingdom of Kroz,” Miller’s breakout shareware hit and the game that put Apogee on the map. How did all of these interests and experiences lead to Apogee and the shareware model of distribution? Eventually, in 1987, I started using shareware through online distribution. 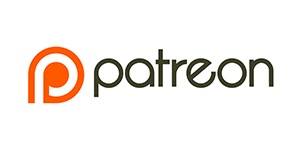 That all came about because I was trying to find an avenue to make money making [the Kroz series of] games, and the kinds of games I was making were not the kinds of games weren’t the sorts of games that appeal to publishers. They wanted games that were big-budget, elaborate games. Mine were more simplistic games. Something else: back in the mid-80s, I really developed an interest in marketing. I read tons and tons of marketing books; I’ve probably read over 300 marketing books over my life, now. So this was a subject I was just devouring. Somewhere along the way in reading these books, the idea hit me that if I release my games online like many people were doing, I’m not going to release the whole thing; that won’t make any sense. Instead, I would release a portion of it. That portion would serve to advertise the full product that people could buy. I think first did that back in 1987. It was a slow start, but it became successful. People started sending me my checks, and that was really the start of the business back in 1987. I quit my day job at a computer consulting company in 1990. I finally quit that time and devoted all my time to Apogee. I thought, “This whole idea of releasing part of a full game as shareware seems to be paying off. It doesn’t really make sense to keep my day job.” That’s kind of how it all got started. Were you able to apply your shareware model to other games in between Kroz and Apogee’s breakout hits like Wolfenstein 3D? I made other games, one called Beyond the Titanic and another called Supernova. These were text adventure games, and I had sold these games to some magazines that were kind of popular at the time. There was one called [? ?39.00], which focused on IBM games. I think they paid me a $1000 for Supernova, and I think they held the rights for one year. I think after the rights expired, I release the full thing online. I didn’t know how to break it up, and I hardly made any money. It takes a lot of effort for people to write a check and mail it out. I figured I was probably losing a lot of payments, so I thought if I had some way to take credit card orders, I could probably do 5 or 10 times better. That’s the reason why I decided to quit the day job in 1990 and focus solely on Apogee. And it was shortly after that that you met the guys who would go on to form id Software. I set up a call center. Also, I’d reached the limit of my programming talents. I saw that there was a magazine out there called Softdisk and there were some really nice EGA and VGA games on there. They were just small games, very simple, but perfect for breaking into episodes. That’s how I ended up meeting John Romero: he was one of the authors of one of those games called Dangerous Dave. I realized that there were programmers out there who were way ahead of me, so instead of continuing to make games, why not find other game programmers and enter into a partnership with them? I could work with them to make the kind of game that would work in the shareware market. My company could handle the distribution of games and all that kind of thing. That’s really kind of how I got set up: back in the early years we weren’t really making games anymore, we were making partnerships. You’ve obviously enjoyed great success in a number of facets of the games industry, but I’m curious: do you regret leaving the programming track? That was just what had to be done. I basically had this really interesting model, this episodic model, so what I really needed was just a lot of games. I started looking at games that were out there, made by these shareware authors that weren’t making anything. I was also looking other places like on these monthly subscription magazines. I was looking for people I could contact and see how they felt about working together. I had also worked for some of those guys, and I knew that [some magazines] were ran by a guy who was very paranoid of losing his talent. So when I saw Dangerous Dave and wanted to contact John Romero, I knew I couldn’t just write him a letter saying, “Hi, John. I started a company called Apogee and would love the chance to work together. Would you call me?” I knew that letter would get filtered by Softdisk’s management. How did you get it past the perimeter, so to speak? 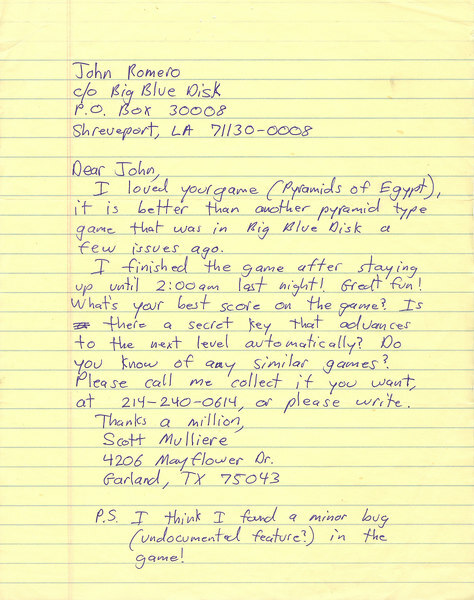 I knew I’d need to write him a stealth letter, so what I did was I wrote in as a fan, saying, “I love your game Dangerous Dave, but you know, I found a bug. If you call me, I could tell you where I found it.” I didn’t get a call back for a couple weeks, so I thought, I’d better send another letter. I sent three letters total, using a different name every time and a different way of getting him to call me, but of course the phone number was the same. I couldn’t change that. I wish I had that letter somewhere, but over the years I’ve lost it. It would be so precious if I could find that. Did Romero jump aboard right away? I remember talking to him later after he’d played Kroz and he said, “There’s no way you brought in $100,000 a year. These games are crap!” They weren’t that great; I knew that. They were just simple text-character-based games. But the model was what made the sales possible, not the games themselves. So John sent me this disk in the mail that was this beautiful, side-scrolling demo of Mario. It looked exactly like what you’d find on the Nintendo; it was just the most amazing piece of technology I’d ever seen. So they had this technology and they didn’t know what to do with it. I said, “Look, there’s so many games you could make as shareware. I promise you guys you’ll hit it big. Your technology is so ahead of its time.” It really was. And that was Commander Keen? Maybe two days later, Tom Hall sent me this one-page concept for Commander Keen. I thought, “This sounds like a fun game. I’ll totally fund it.” I think they wanted $5000, and I had that, so I said okay, sure. Over the next months they developed the game, building it over time. 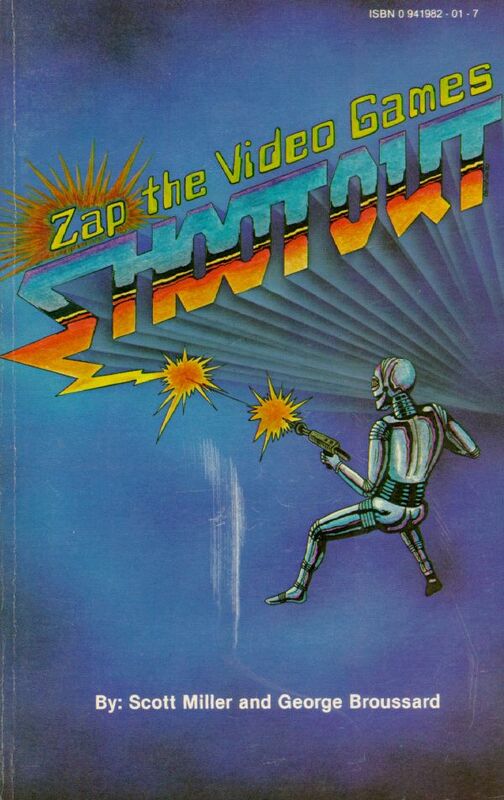 I’d send a couple design ideas that made it into the game, told them how to structure the three episodes for shareware, gave them all the shareware screens–all the shareware wrappers to make sure everything was put in place. We released the first episode of the game on December 10th, I think. I remember releasing the game to all the BBSs I had partnerships with because they would feature the game on their front pages. Then I went away on a ski trip. Before I left, I put a message on my phone machine because I didn’t have customer relations at the time, so I just used a message machine. Two days into my ski trip, I called the machine. It was maxed out. It was maybe 30 straight minutes of people placing orders. I thought, “Oh my God.” I remember having my mom go to my house, write down all the orders, and reset the machine so it could take more orders. I left the ski trip a couple days later and immediately hired a guy to go to my house and take orders. That was Shawn Green. Shawn would come to my house and man the phone all day to take orders. In the first month, I think we made $20,000. My deal with id was we were splitting things 50/50. So Keen just took things to a whole different level from my Kroz games. Once my company was associated with Commander Keen, the game became the rage of the shareware world. Not only was the game great, but we’d worked it out so that it made the authors and Apogee tons of money. Suddenly, people were calling me. Tim Sweeney sent me a demo of his game [name?] and said, “Hey, would you be up for working with me?” I still kick myself to this day for not working with him. He was brilliant. His game was cool and all, but it was kind of like Kroz and we were working toward getting better in graphics. Of course, Tim went on to become a big success at Epic Games. So yeah, the floodgates opened. We started releasing probably 5 to 10 games a year for a few years there. We were making a lot of money. Those were good times. In part two, Miller goes into more detail on how he applied the shareware model of software to PC games, how he handled developers who scoffed at the notion that shareware products earned big money, and more.